With the pale scent of early spring wafting across the rooftops of Monkseaton I was eager to be out across the undulating tops of the Cheviot Hills. I parked near Windyhaugh in Upper Coquetdale and, as I sauntered along the rough track to the remote farmstead of Uswayford, the sleepy-eyed sun climbed above the broad-shouldered Shillhope Law. I have visited Bloodybush Edge on numerous occasions by various well-trodden routes. Now I was intent on a totally different approach. A quick intake of breath and then I forded the Clay Burn and clambered up the steep and rarely-walked slopes of Hen Hill towards my objective, little more than 1 mile away. A tangle of converging fences and a pristine white triangulation pillar mark the boggy top of Bloodybush Edge, the sixth highest of the Cheviot Hills. At 610 metres above sea level, I had reached the highest point of the walk. The main goal of the day, however, still lay ahead. Setting my compass, I tip-toed across a pathless minefield of heather-covered peat holes. After 400 knee-twisting metres, I reached the little-visited Shivering Stone, not so much a large single stone more a cascade of small, weather-beaten boulders. From this lonely place, high in Northumberland, I enjoyed unimpeded views across the tree tops of the vast Kidland Forest. Concealing a complex system of slacks, cleughs, sikes and burns the forest covers an area which, in 1825, was described as consisting of, “a number of lofty, verdant hills, of conical form”. 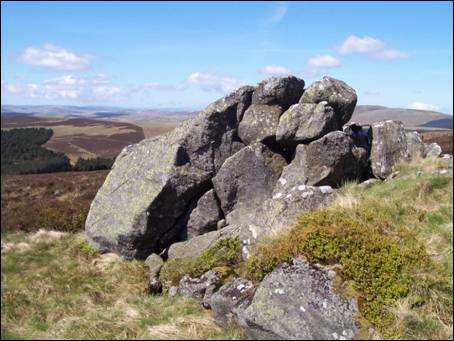 These days the hills are dressed in a trendy shade of `Forestry Commission Green` which does little to spoil the fantastic panorama stretching from the Simonside Hills to the border-straddling Windy Gyle. As the crow flies I was now 3 miles from my starting point but, with no straight-line return route possible, I made tracks across the unremarkable, boot-sucking summit of Yarnspath Law before descending to the former farmstead of Fairhaugh. Situated in a forest clearing on the banks of the delightful Usway Burn, this was the perfect place to catch my breath before finally making my way back to Windyhaugh and the beautiful River Coquet. I vowed to return soon.